Have you wanted to backup the content of your cPanel account to one of the many cloud storage locations? There is a third party site that will allow you to accomplish this very easily. You can move your account documents to one of the many listed below with just a few steps. You can visit their website to find all of the destinations that you have make a connection to. We will detail out the steps to successfully get this setup to sync your files between your cPanel account and Dropbox below but the same process can be used to any of the other storage locations. NOTE: Please see the directions below on how to also sync a backup copy of your MySQL databases. There are a few pre-work steps but we think you will find that they are not too difficult. There is a setup process we would recommend in cPanel and then another one on the third party site. The first step is to get your cPanel account ready to transfer files. 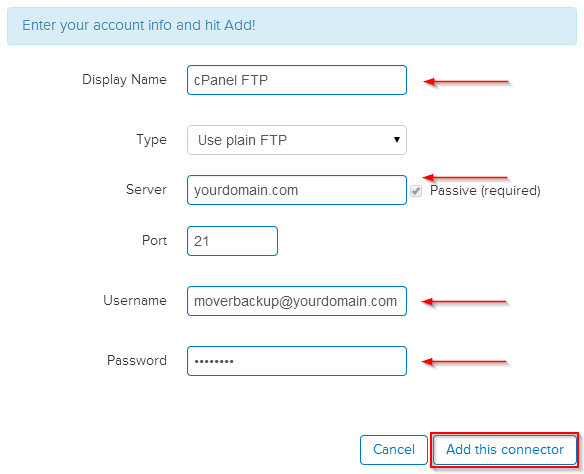 The mover.io connector will access your cPanel account through FTP so we need to make sure we have the proper FTP login credentials to your cPanel account. We reccommend that you setup a new FTP account in cPanel and not to use your main cPanel login information. When you sign in you should see a screen like the snapshot below where you need to select a source and destination for your files. Click on "New" connector and then select the "FTP" as the connection you want to make and click "Next" on the bottom right. This will take you to a screen to enter your FTP credentials that you created in cPanel in Step 1. We have pointed out the areas you want to fill in below using the examples we provided in Step 1 above. Once you cilck on "Add this connector" mover.io will establish the FTP connection and take you back to the Select Source and Destiniation page assuming you entered your informatoin correctly. Now go through the same process for the "Select Destination" option for Dropbox. Click on "Select Destination" and then on the "Dropbox" icon and "Next" in the lower right hand corner of the add connector dialogue box. 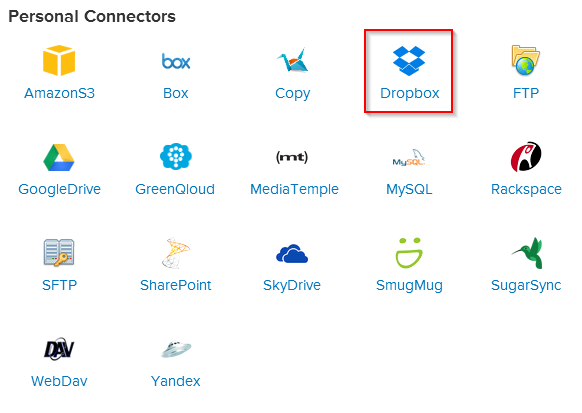 The difference here is that when you click on add this connector it will take you to dropbox to authorize the account through the Dropbox website. 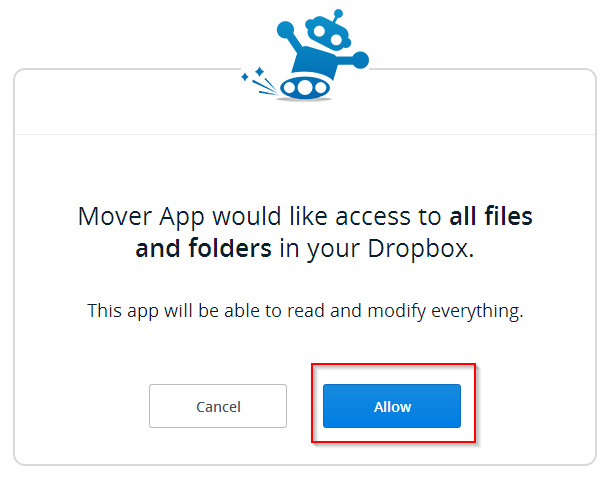 Once you click on "Allow" at dropbox the connection is setup and ready to use. Now that you have a source and a destination you just have to setup the transfer. Select the source and the destination that you already setup and start the transfer. That is it! 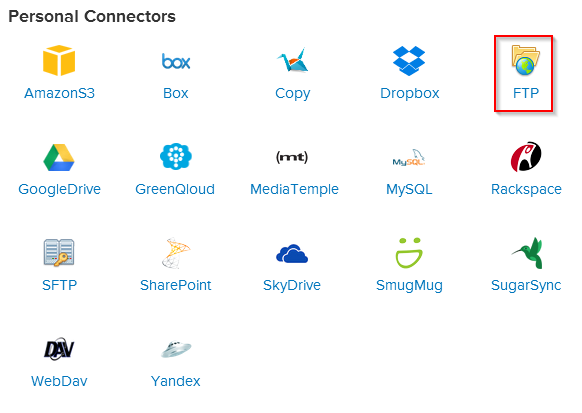 You can now transfer your cPanel files to Dropbox or setup any connection you want and backup your website contents. You can also easily setup a cronjob that will dump your SQL database to a file so you can add that to your cloud sync. 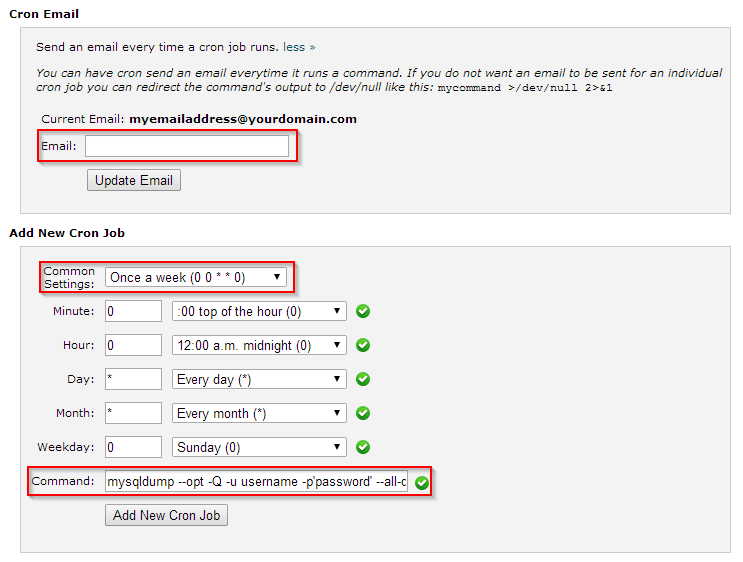 Please review this article on how to create cronjobs in cPanel to familiarize yourself on properly setting them up. Here is the cron command line that will create the SQL file that contains all of your database informatoin for your account. This can be used to easily restore your content if you ever should need it. Here is an example of what this would look like if my cPanel username was george with a password of 23uslkjf42j and I wanted the file stored in a backup folder located in the public_html location of your website. Enter the email address that you want the cronjob emails sent to, set it to run weekly and then copy and paste the mysqldump command that we create above. Click on "Add New Cron Job" and you will have setup a weekly job on the server that will copy all of your database content to an SQL file in your backup folder. This with the combination of the mover.io account above could automatically sync this file to your dropbox account on an interval of your chosing!